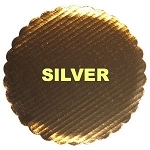 Cake plates and corrugated cake boards are the base to your beautifully baked cakes,. cupcakes and more. Whether you need round or square, we have what you’re looking for. Choose gold or silver scalloped plates for special events or choose corrugated cake boards that are not only durable, they’re grease resistant too. 6”, 8”, 10”, 12” and 14” square and round available. Here at Sweet Life, we are proud of our goods. All cake plates, boards, and boxes offered at Sweet Life Cake Supply is made with high quality materials, guaranteed to give you the perfect result every time you use them. No cheap knockoffs and imitations - when it comes to your baked goods, look no further - we have you covered!